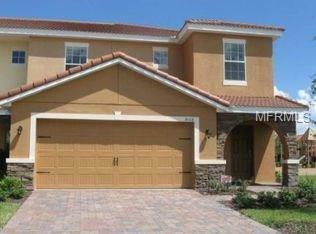 Beautiful end townhome in gated community. An open floor plan with many windows makes this unit bright and airy with great views of the playground,pool and clubhouse. Neutral 42"kitchen cabinets,granite countertops bar, pantry and all appliances. Guest 1/2 bath downstairs w 2 full baths, 3 BRs and laundry upstairs. Huge master suite w/ walk-in closet and large bath w/tub, walk-in shower, and dual sinks. New paint throughout with tile down andnew carpet up.Great storage/ closet space. Covered lanai & entrance.